Search for more areas in Calgary. You'll find Temple Calgary Over in the northeast part of Calgary. This one also occupies the northeast corner of the larger area quite often referred to as "the Properties". 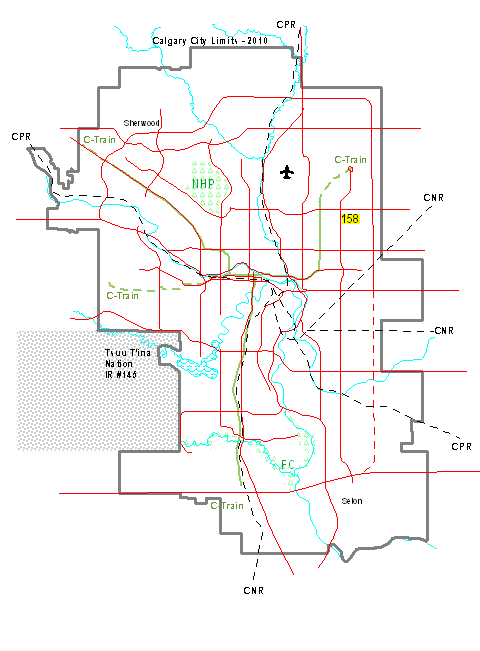 Temple has a population of about 11,000 and they live in the land area east of 52 street, west of 68th street as well as between 32 Avenue and McKnight Blvd. See the Number 158 on the map above. Ok, so we now know how to get here...now what? The Temple community hall serves this neighbourhood. People attend various courses and kids' clubs, sporting events, and dances at the hall. Temple features many parks, mature trees and recreational opportunities, including a reasonable walk to the Village Square Leisure Centre and Library just south on 52nd Street. There is considerable shopping in that complex, so you might choose to drive anyway. Residents also appreciate the easy access to public transportation and shopping, several churches, including the prominent St. Thomas More Catholic Church and Peter Lougheed hospital close by, as well as many quiet streets away from traffic. All these things combined make the neighbourhood great for raising kids. The 18 minute drive to downtown is quite reasonable as well, as most newer, more expensive neighbourhoods will have you commuting for much longer times than that. Drivers especially like the handy Stoney Trail, 16th Avenue and McKnight Blvd for quick transportation. These, along with the lower housing prices and good transit access, in which it is about two kilometres or less to the Whitehorn C-Train station, help make Temple a desirable place for families who are entering Calgary and Canada for the first time. What schools are there in Temple? Guy Weadick School and Annie Foote School are there to accommodate the youngest children, kindergarten to grade 6. Then they could go on to The Annie Gale Junior High or Dr. Gordon Higgins School. Senior high students will typically attend Lester B. Pearson High School, just south on 52 Street. Catholic families have convenient options too, including St. Thomas More and St. Wilfrid for K-6, Father Scollen and St. Martha for K-9 and Bishop McNally High School just north in Falconridge for senior high school students. Go back from Temple Calgary to the Calgary Real Estate web page or visit the Calgary City Maps homepage.